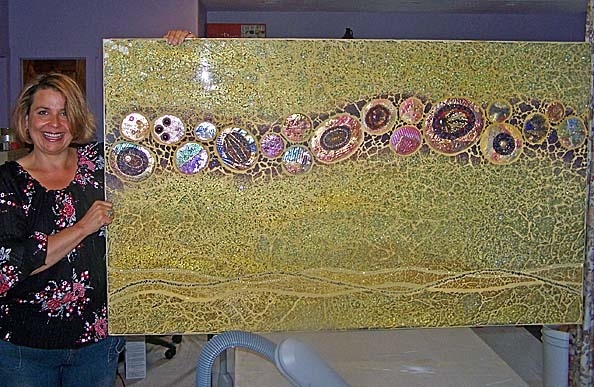 Tamara Kikel and I met a few years ago in Ellen Blakeley's Beginning Tempered Glass class at Institute of Mosaic Art. There was an immediate vibe between us. Two years later, when she asked me to come to Austin to collaborate on a piece, I was thrilled. It now hangs at The Austin Centre. I hope if you live in the Austin, Texas vicinity you will stop by and see it. Afloat is another study in the combination of handmade polymer clay tiles and tempered glass mosaic. The thought of titling it Ellen Laurie came to mind because, while the combination of these materials is my own innovation, Laurie Mika's polymer clay mixed-media mosaics, as well as Ellen Blakeley's tempered glass mosaic technique are definite touchstones. During our many hours of work, Tamara and I talked about these ladies with great enthusiasm. But, that's not the title. I hummed, from the inside out, in Austin. But, that's not the title, either. Afloat is about movement, space, flow. It's about the perfection of a circle. It's about feeling high and floaty and ... good.